Ryan Integlia and Tiffany Tong have established a student-run global organization called em[POWER]. The nonprofit helps waste-picking communities to gain access to education and health care and improve their quality of life through the use of renewable resources. Waste-picking is a way of life for millions of children who live in extreme poverty. 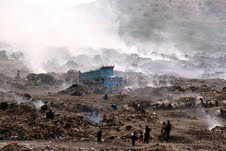 Living in landfill communities, they and their families spend their days scavenging dump sites for recyclable materials in order to earn $2/day. Determined to understand their needs and interests, and explore solutions and nonprofit partnerships, Ryan Integlia and his friends visited landfill communities in Pakistan and Bangladesh. Next, Integlia, a graduate student in electrical engineering at Rutgers University, along with Tiffany Tong of Princeton, established a student-run global organization called em[POWER]. The nonprofit helps waste-picking communities to gain access to education and health care and improve their quality of life through the use of renewable resources. “Our approach is based on two principles–understanding the needs of each particular community, and forming partnerships with local organizations,” said Nasir Uddin, Vice President, em[POWER]. He spoke with a passion that was palpable even over the telephone. Next steps for the organization will be to explore needs and partnerships in landfill communities in Brazil, Mexico, and Cambodia. em[POWER] is one of 940 commitments that will be presented by university students at the Clinton Global Initiative University (CGI U)’s Fourth Annual Meeting, that will be held in San Diego, April 1-3. em[POWER]’s commitment for CGI U 2011 will be to expand their work in Bangladesh, where they are partnering with a newly established local school. em[POWER]’s goals are to set up and provide training for composting, waste management, and sorting in order to improve sanitation, limit disease and illness, help people increase their earnings, and help them operationalize their output. As Editor-in-Chief of the Saltman Quarterly (SQ), University of California San Diego Division of Biological Sciences, Leila Haghighat’s commitment is closer to home. She and her fellow students publish an annual biology research journal, one of only two in the nation. Having tutored students from underserved communities who attend a nearby charter school (Preuss), Haghighat and her colleagues invited two students from Preuss to join them last summer to learn about publishing. For CGI U 2011, the editorial team committed to invite five students from Preuss and other local high schools to participate as Journal Scholars for a full year–working alongside the journal staff, conducting research under faculty advisors, and translating their research into feature articles. “At CGI U, we are helping students to effect change,” said Keisha Senter, Director, CGI U, in a private interview with me this afternoon. Having run CGI U from the beginning, and for the fourth year in a row, Senter explained to me that there are many values to the annual meeting, including workshops and skills programs on fundraising, grassroots engagement, partnerships, and working with the media. And in addition to meetings with President Bill Clinton, as well as Chelsea Clinton, students will participate in sessions on top global issues with leading speakers from diverse backgrounds and perspectives. We believe that “if one form of poverty can be solved there is no reason why others cannot be. We are simply trying to show the world that poverty can have a solution,” said Integlia of em[POWER]. Imagine 1,100 students coming together from 90 countries with this kind of determination along with the drive, curiosity, passion, and all the ability necessary to save the world.